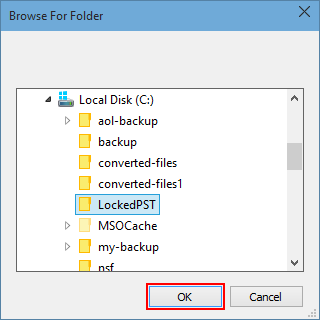 Remove Password from PST File for all MS Outlook 2007, 2010, 2013, 2016 versions. The software is designed to remove Password of PST file of Outlook in Bulk Process with simple steps for the users. Easily eliminate Lengthy and Multilingual Passwords types. Supports latest version of MS Outlook 2016, 2013, 2010, 2007 & below versions. A user can remove Passwords from many PST files at once. The Software provides an option to select folder holding multiples PST files & remover password protection applied on it. PST Password Removal display status of each PST file when it is selected using “Add Folder” or "Add File" option. 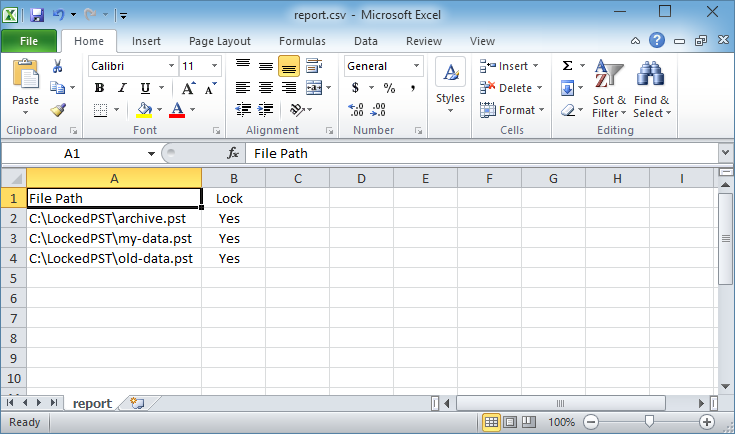 Generate report of files details such as status & directory path in CSV format. 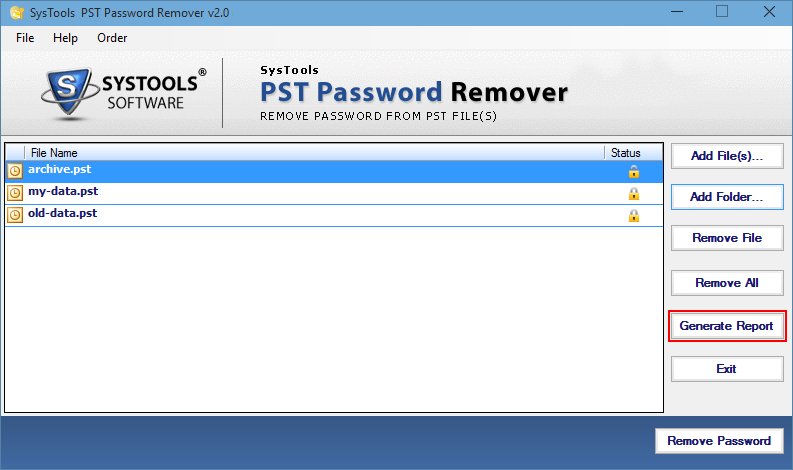 PST Password Remover eliminated Old Password from the files. The user can store them in the desired location and apply a new password of their choice. Software work with all versions of Windows Operating system. It also support all version of Outlook PST files (ANSI & Unicode) format files & remove password from PST Files. 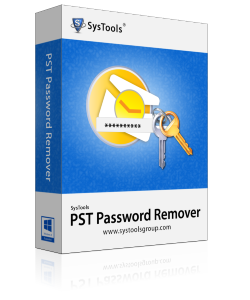 PST Password Removal tool software is designed in such a way that a non-technical user can easily cope up with the simple steps needed for removing password from PST Files. The user interface has single panel with multiple options to work with, thereby providing simplicity. PST Password Remover recover all types of lengthy, multilingual password. PST Password remover easily recover password generated from digits, alphabets, special character etc. You can even apply new password on files. Outlook Password Remover – A Close Insight! Microsoft Outlook offers features to protect PST File by applying Password on it so that only the authorized user can open data, includes Email messages, Contacts, Calendar, Tasks, Notes, etc . A user can set a password for PST according to work and every time user opens the desired PST file, he needs to provide the correct password to it. But sometimes when forgotten the password of the PST file and not able to open the PST file of Profile after various attempts, a user can go for PST Password Remover to unlock the PST file, so that user can again view the information and work on it. Tool is a standalone utility that not only remover password from PST file but also allow a user to reset the Password of unlocker files. It also allows Outlook user to remove password of PST file in Bulk. No need to worry about lengthy and multilingual password as software supports and recover all password types. Install & Run Outlook PST Password Remover. Select "Add File" option. Now you can see the Encryption status of PST file in interface of the software. To save report related to status in CSV format. Click on Generate Report tab. See the File Path and Encryption status of PSt file in CSV File format. Click on "Remove Password" button to unlock the Outlook PST files. Outlook Password Recovery Tool- Replies All Doubts & Queries! Can I remove password of Outlook 2003 file? Yes, Definitely, PST Password Remover software support all versions of Outlook. Also, support both formats of Outlook files such as ANSI & UNICODE. Is Password remover tool change the internal file data during password recovery process? No, PST Password Recovery Tool doesn't change any internal data during removing password from PST File. 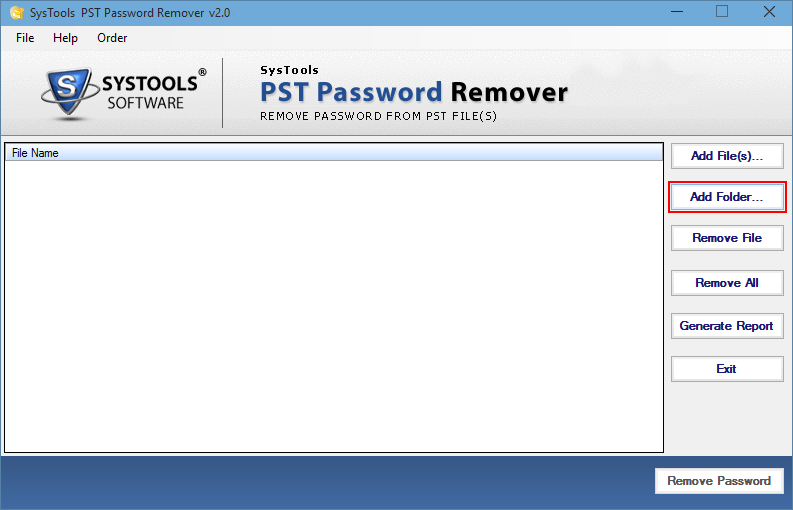 What kind of passwords removed by PST Password Remover software. Software recovers all types of passwords. It can be lengthy, multilingual, a combination of alphabets, digits, symbols etc..
Outlook PST Password Remover, Great tool to remove old password from PST files easily. Works great with all versions of Outlook versions. Able to removed forgotten password of my old files. Simple and Easy way to remove password from PST Files using Outlook Password Remover. Finally able to view all Emails, contact, Notes data files.